This innovative brain health workbook has sold over 2.5 million copies globally! Dr. Kawashima, a prominent neurologist in Japan, developed this program of daily simple math calculations that can help boost your brain power, improve your memory, and stave off the mental effects of aging. 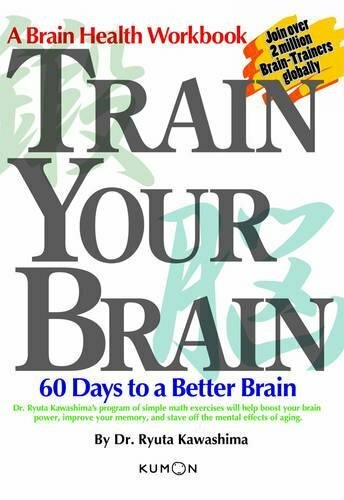 The exercises in this book have even been shown to help those suffering from Alzheimer’s. The idea, Dr. Kawashima says, is to "work out the brain much like we work out the rest of our bodies. It has long been known that regular exercise helps slow the deterioration of our muscles, and the same is true for our brains." Dr. Ryuta Kawashima is a professor of neuroscience at Tohoku University in Sendai, Japan. He has spent the last fifteen years pursuing his dream of making brain health maintenance a public priority. "I have developed a program of keeping your brain young that consists of a daily program of simple calculations. It may sound too simple to be true, but my research has shown that this activity increases regional cerebral blood flow to the largest portions of the brain and stimulates the creation of neural pathways. We all age, and it is only natural that our brains age too. The good news is that mental decline is not inevitable. We can keep our bodies younger and healthier through regular exercise. The same is true for the brain – if you exercise your brain, you can prevent your cerebral function from deteriorating. It’s never too early to begin building a better brain! It only takes a few minutes a day."